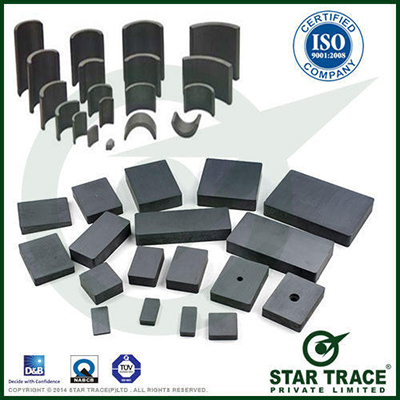 Ferrite Magnets Manufacturers, Applications of Ferrite Magnets, Ferrite Magnets: Star Trace Pvt. Ltd.
Ferrite Magnets are Composed of Strontium carbonate and iron oxide. They are charcoal grey in color and usually appear in the forms of discs, rings, blocks, cylinders, and sometimes arcs for motors. A powdered mixture of strontium carbonate and iron oxide is injected into either a wet press or dry press for forming. During this pressing process, a magnetic field is applied in the direction of preferred magnetization to orient the material and increase the magnet's performance potential. This magnet is considered "oriented". If not exposed to a magnetic field at time of formation, it is called "non-oriented" (Isotropic). After the molding process, the material is then sintered at about 1010o C. This process is similar to that of kilting ferrite pottery, thus the popular name "Ferrite" magnet. Lastly, the magnet is finish-ground to size with a diamond-bladed grinding wheel, magnetized, and inspected for shipment. Pressed dimensions are either +/- 2% or +/- 0.5mm whichever is greater. Cut dimension are either +/- 3% or +/-0.5mm, whichever is greater. Thickness tolerances are normally ground to +/- 0.1mm. Visual imperfections such as cracks, porosity, voids, surface finish, etc., (commonly found in sintered ceramic magnets) do not constitute cause for rejection. Ferrite magnet material is extremely brittle and can chip or break if dropped on a hard surface, or if allowed to "Jump at" an attracting object. Handle with care. The weakest grade of Ceramic material is grade 1, which is typically non-oriented. Grades 5 and 8 are oriented ceramic material. Grade 8 is the strongest ceramic magnet material available . When making magnetic assemblies with ferrite it is typically easier for production purposes to magnetize the product after assembly. Since ferrite material is so brittle, it requires special machining techniques and equipments. We are fully equipped to cut and grind ceramic material to your specifications.